Kathmandu, A new 7.3-magnitude earthquake and several powerful aftershocks shook Nepal today killing more than 60 people and triggering panic in the Himalayan nation already devastated by a massive temblor less than three weeks back that had claimed over 8,000 lives. Nepal’s Home Ministry while claiming that 1,117 people have been injured in the latest quake that hit hardest in remote mountain districts northeast of the country’s capital Kathmandu. The earthquake struck at 12:35 PM, some 83 km east of Kathmandu near Mount Everest at a shallow depth of 15 km, the US Geological Survey(USGS) said. The agency had earlier measured the quake at 7.4 on the Richter Scale but later revised the intensity to 7.3. The quake hit Dolakha and Sindhupalchowk districts – the worst-affected areas in the last month’s temblor. At least 19 people were killed in Dolakha, police said. A second tremor of 6.3-magnitude struck about 30 minutes after the 7.3-magnitude quake that sent terrifed residents running into the streets of the traumatised capital. The USGS said there were five more aftershocks measuring over 5 on the Richter Scale after the second tremor that kept people on the edge. Police said half-a-dozen buildings were destroyed in Kathmandu. The fresh quake triggered massive panic among the people, who have been staying in the open since the 7.9-magnitude temblor struck on April 25, killing over 8,000 people and flattening thousands of buildings besides destroying whole villages. “All available helicopters along with Medical Team; SSR Team going to be mobilised to Dolakha and Sindhupalchowk soon,” said Nepal’s National Emergency Operation Centre. The Indian Air Force (IAF) has stationed eight helicopters in Nepal and one of them conducted an aerial survey soon after today’s quake. Nepal’s only international airport, the Tribhuvan International Airport, was briefly closed by authorities and flights to Kathmandu were diverted. Authorities have also ordered all schools to be closed for the next two weeks. Strong tremors were felt in Kathmandu where people ran out of their houses in panic and some even started crying. Authorities appealed to people to stay in open field. The temblor triggered landslides and toppled buildings in Nepal that recently witnessed its worst quake in over 80 years and over 160 aftershocks. At the main hospital in Kathmandu, patients hurt in last month’s quake were brought out in wheelchairs to avoid further injury. Today’s quake had its impact in several cities in Bihar, West Bengal and UP and tremors were felt across vast stretches of east and northeast India, where the death toll has reached 17 so far. The tremors were also felt in China, where one woman was killed in Tibet. A major earthquake on Tuesday jolted Nepal, striking fear among the people and causing panic in a country which was barely recovering from the devastating April 25 temblor. Death toll in earthquake in Nepal has risen to 42 and over 1000 have been injured, according to Nepal’s home ministry. 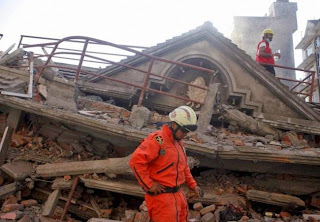 Over 40 people were killed and thousands were injured when a big earthquake struck Nepal on Tuesday. Initial reports said that 26 people were killed in Dolakha district, located about 170 km from here. The airport here re-opened after a shutdown following a massive earthquake that shook Nepal. Two international flights took off from the Kathmandu airport around 2.30 p.m.
One flight — TG 320 — of the Thai Airways took off from Kathmandu and was headed to Bangkok. An Indigo flight — 6E 32 — flew out of Kathmandu for Delhi. Flights moving to Kathmandu were diverted when the airport was shut down. At least seven people were killed and over 150 were injured when a massive earthquake struck Nepal on Tuesday, police said. Police spokesman Kamal Singh Bam said that four people were killed in Chautara town in Sindhupalchowk district and three people died in capital Kathmandu. He added that dozens of buildings have collapsed. According to aid agencies, at least four persons were killed and 12 others injured in Sindhupalchowk and several buildings collapsed in today’s quake. Home Minister Rajnath Singh on Tuesday said India would provide all the support required to Nepal, which was once again jolted by a major earthquake. “India is ready to provide all the support which Nepal would require,” the minister told reporters. Dozens of buildings which had developed cracks in the April 25 temblor collapsed on Tuesday when another major earthquake shook the country. An eyewitness said that he saw a building collapse here. Another said that he saw debris falling on a taxi packed with people. Dust rose as the buildings began to collapse following the 7.3 magnitude earthquake, which struck at 12.40 p.m. Its epicentre was at Kodari and quite close to Mount Everest. Kodari is about 100 km northeast of Kathmandu. Onlookers were left dazed and distraught on seeing the buildings collapse with a roar, a replay of the April 25 quake horror. Two strong aftershocks shook Nepal on Tuesday. The USGS said that the earthquake measured 7.3 on the Richter scale and its epicentre was Kodari, northeast of capital Kathmandu. It had initially said that the quake measured 7.4 on the Richter scale and its epicentre was in Zham in China. The epicentre was quite close to Mount Everest, the world’s highest peak at 8,848 m.
Two aftershocks followed in quick succession after the main earthquake which struck at 12.40 (Nepal time). The first aftershock measured 5.6 on the Richter scale and its epicentre was 25 km southeast of Kodari, Nepal. The second aftershock was considerably stronger and it measured 6.3 on the Richter scale. Its epicentre was 33 km from Ramechhap, Nepal. The quake measuring 7.3 on richter scale struck at 12:35 PM, some 70 kilometres east of Kathmandu at a depth of 18.5 kilometres, Indian Meteorological Department said, adding three aftershocks of 6.2, 5.4 and 4.8 followed the quake.